I finally added the last borders to my Gwennie Medallion. The outer border isn’t exactly what I wanted, but this top was all from stash and I wasn’t about to go shopping now. Before I had the borders on, I started thinking about the quilting. I use an app (no longer available), called Adobe Ideas to “draw” my ideas on a photo. This is the photo I started with. Here it is with my scribbles on top. This is gonna take a while! I am planning to decide on thread today and get started soon. I want to use a fine thread in a neutral color and use the same thread throughout. 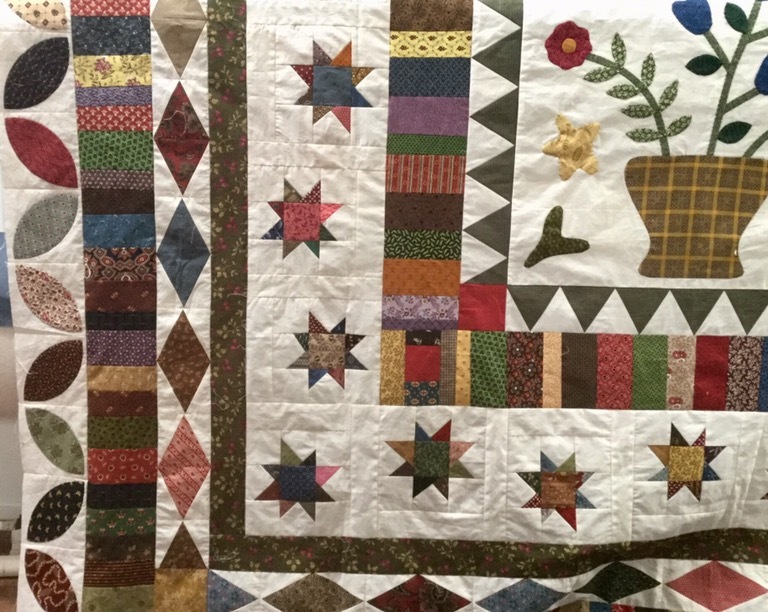 This entry was posted in Civil War Repro Quilts, Gwennie inspired Medallion QAL, Gwennie QAL, Long Arm Quilting, Longarm Quilting, Uncategorized. Bookmark the permalink. What a great quilt! The Adobe app looks very useful. Too bad for the rest of us that it’s been discontinued. Exciting plans!! I look forward to seeing this one being quilted. It’s a gorgeous quilt! Good luck with your quilting plans. It will take a while, you’re right, but it will be so beautiful. I actually like that border on it. None of my business, but wouldn’t Gwen have handquilted hers? Katy, I really like the borders you added….they tie everything together so well! 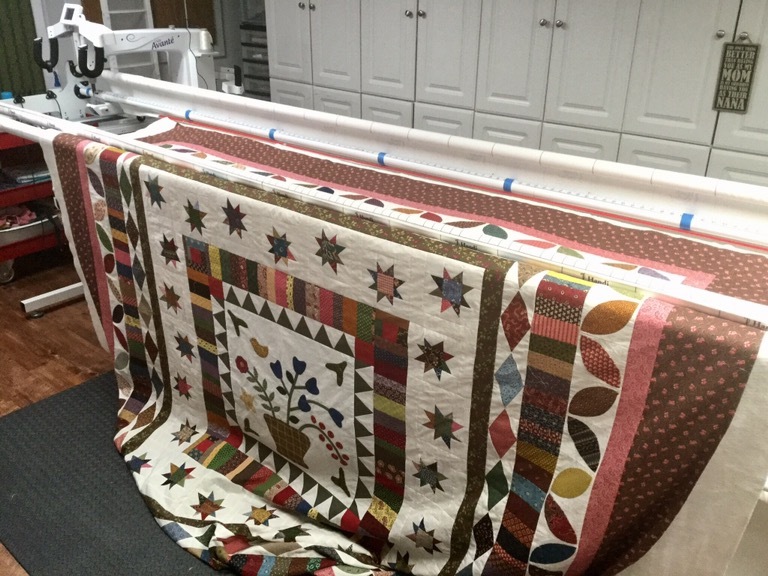 Cannot wait to see it when you have completed the quilting…it is going to be great! Thanks for taking us along on the journey! Oh boy! Looks like a lot of work, but I can’t wait to see the results! This is really beautiful and I like that outer border. Wow! I could use an app like that! Looking forward to seeing the finished quilt! 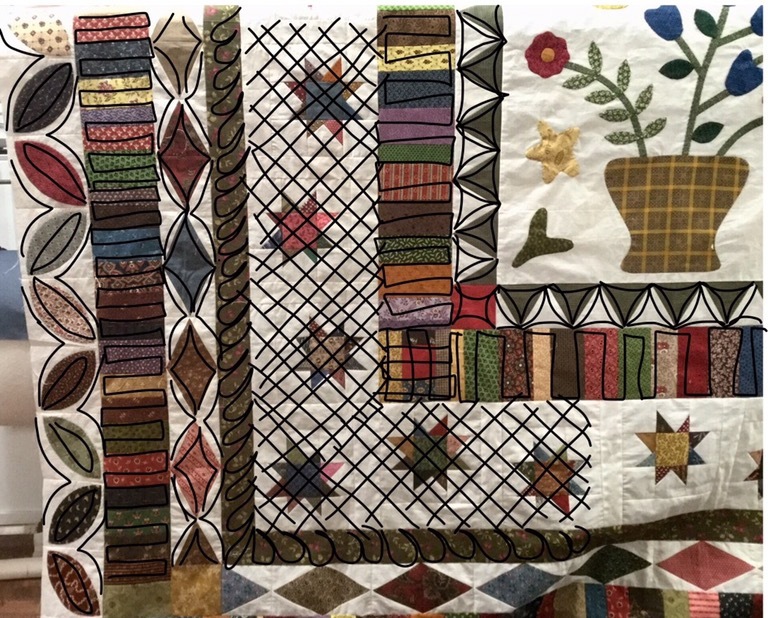 Good job on using your stash for the whole quilt! Love it! What a great quilt! Love all the layers to the medallion. But I really like your sketching for your quilting ideas. It gives me ideas to try. Great toy, er, tool for planning your quilting. I’ll bet it’s a lot of fun to use, too. The quilt is gorgeous! Have fun quilting it! That app looks interesting! Nice way to doodle designs. This quilt is gorgeous and such a nice way to use up stash fabrics.